My oldest just graduated from high school. I may have mentioned this a few thousand times before…. We are now in the process of planning her party. Being a girl, my first concern is getting the invitations done right-with the right pictures and the right wording…. we had to wait for little details like the where and the when to work themselves out…. but finally agreed on a date. I’m into convenience, I’ll pay you to make my life easier…. 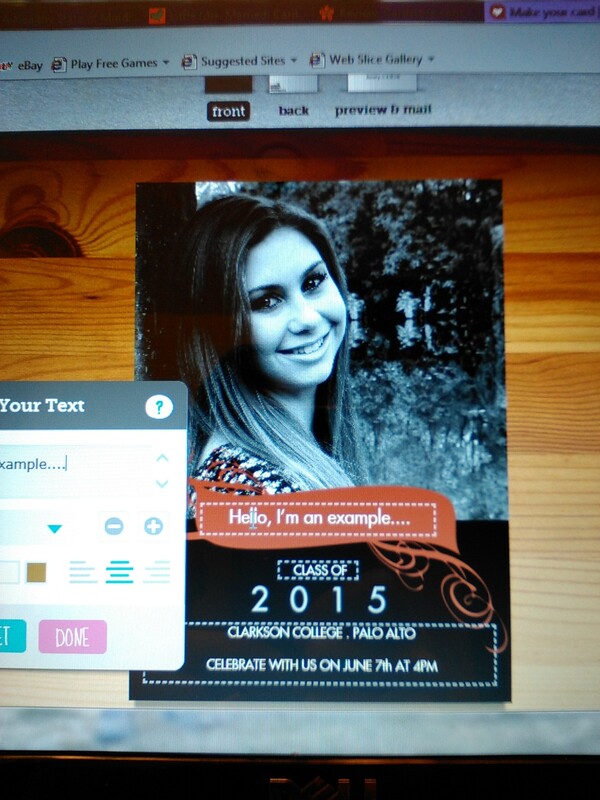 so ordering invitations I could customize online was the only option for me. Enter cardstore.com, who asked me to review the invitations I ordered from their site. The site was pretty easy to navigate. 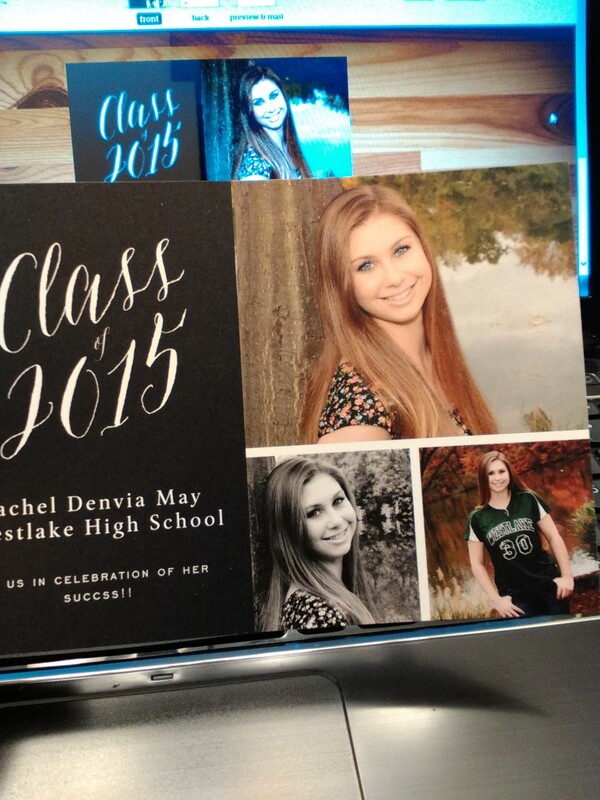 There were several graduation announcements to choose from, and we debated over a few of them. There are cards with pictures, and without. I had one all picked out, pictures in place, ready for the final approval from the 18 year old “adult” daughter. does this look like blood to you?? She didn’t like that part of the background was a red colored swirly/scroll design…. looked like blood to her and she wanted it a different color. It DOES look a little vampire-ish I guess. Problem… you can’t change any of the background colors or designs. Put a damper on it for me, as we then had to find another card she would accept. I didn’t realize how picky she was!! Didn’t like the lettering over here, didn’t like how something looked over there…..
We finally agreed on a design and fought briefly over what pictures to use. Don’t pay attention to the horrible photo quality. This is just my crappy go-phone camera as my iPhone is still MIA. My next dilemma was wording. The front of the cards don’t give much room other than the basics of name, school, year, and a one liner maybe…. I needed options on how to word our invitation, given that our family dynamic isn’t the traditional mom, dad, 2.5 kids version. We had agreed to have the party at my ex-husbands house instead of having 2 separate parties. We both still share the same last name. How do I make sure we look separate, but together for our daughter….and equally hosting the party at his house? Would have been nice to have some guidelines or tips on how to phrase that whole thing. That might be asking for a lot though…. I did my best with free script on the back of the invitation. Once that part was figured out, the rest was a breeze. Awesome things about cardstore.com…. they will either mail you the invitations and blank envelopes, or they will MAIL THEM FOR YOU!!!! I could not actually use this service, as I am still compiling addresses, and doing my best to just hand deliver as many invites as I can. It is nice though to have the option, and I’m sure people more organized than myself would love to take advantage. The site is incredibly easy to navigate. In fact, along with all the positives that go with that statement, that is probably also the only negative. There is so much ease of navigation, it seems like there is a little lost in the way of choice. The backgrounds and certain parts of the text can’t be altered. This can be a problem if you love the invitation, except for one part that you just hate but can’t change. There are plenty of options however…. ranging from text-only, to one photo, even up to 12 pictures. The styles offered cover a wide range of tastes, it would be hard NOT to find something you like. 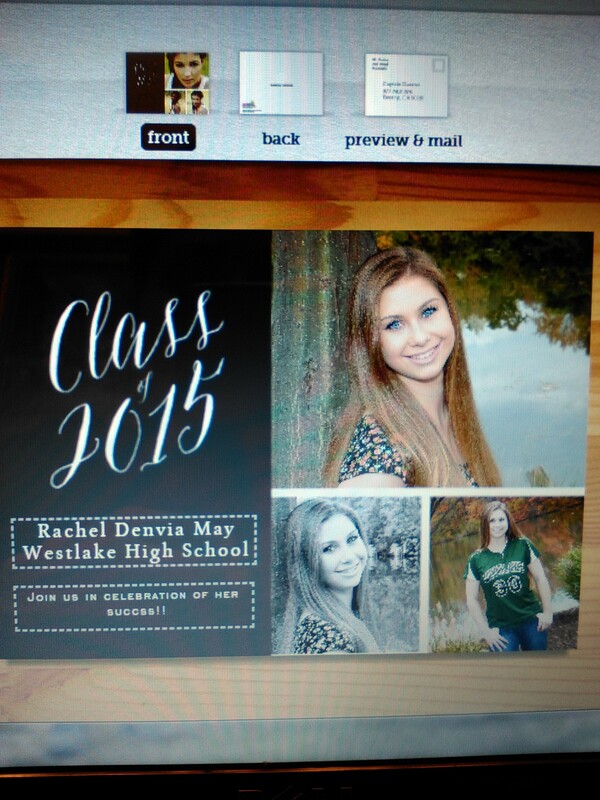 You can also shop for graduation announcements OR invitations…. and thank you cards can be personalized and ordered as well. After reviewing the front and back of our card–nice because you HAVE to do that before completing your order–I clicked to finish and check out. They were in my mailbox in just a few days, super fast shipping. All in all, a fun and very convenient experience. Gives me all sorts of ideas for upcoming birthdays, and I can even make up my own holidays and create cards for virtually any occasion! This entry was posted in cardstore.com, graduation, high school graduation, online shopping, review and tagged grad announcements, graduation, graduation invitations, high school graduation, online graduation announcements, online invitations. Bookmark the permalink.